Dr. Hug earned his undergraduate degree from the University of Michigan, Ann Arbor, and then attended Stanford University. He received his Master’s degree from the University of California, Berkeley, and his medical degree from Wayne State University of Medicine, Detroit. Dr. Hug completed his residency in internal medicine at William Beaumont Hospital, Royal Oak. Dr. Hug is certified by the American Board of Internal Medicine and regularly appears in local and national Best Doctor lists. He is a member of the Michigan State Medical Society and Oakland County Medical Society. Dr. 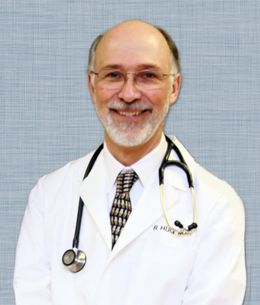 Hug has been practicing internal medicine since 1990.